Soldado at best is an echo of the far superior, Sicario. It has moments of tension and gun-play that feels real and exciting, but the stakes lack punch, and consequently I never found myself worried that Alejandro (Del Toro) and Graver (Josh Brolin) were in mortal danger. I always felt they’d pull through. The Macer (Blunt) character in Sicario was someone I could personally relate to much easier than the seemingly indestructible and elite operators that wade through scores of baddies in Soldado. Macer (Blunt) was more sympathetic in the “in over her head” role in the original. 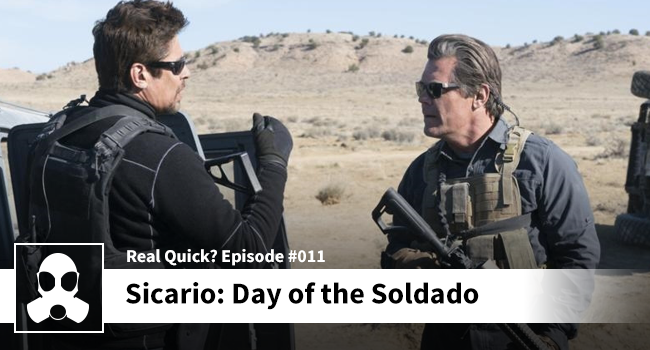 Soldado also failed to capture the sense of dread and tension that hung over every scene in Sicario. This lead to much more muted conflicts that never felt as fulfilling. Overall, I’d recommend Soldado, but it’s nothing to write home about despite some killer performances from Brolin and Del Toro.